Japanese exchange student Aoi still remembers the “shocking moment” when she saw a trash bin in a Korean restroom stall for the first time. “As there are no such trash bins in toilets in Japan, I was shocked when I saw the bin overflowing with used toilet paper,” Aoi said. Aoi is one of many people who been disgusted by the bins inside the cubicles of Korea’s public restrooms. They have long been a controversial topic among Koreans and foreign visitors alike. Following criticism and complaints, the government decided to remove all trash cans from public restrooms starting January 2018 by enacting the revised implementation ordinance of the Public Toilets, Etc. Act. Under the law, the providers of public restrooms who leave trash bins inside cubicles can be fined up to 1 million won ($891) if the bins are not removed after a warning. According to a survey conducted by the government in 2017, 81 percent of 1,200 respondents said that eliminating trash cans from toilet cubicles would make the space much cleaner. A year after the implementation of the law, many public restroom users, including Aoi, have welcomed the move. “I feel the restrooms without the waste bins seem much cleaner compared to ones that have the bins in terms of the appearance and hygiene,” Aoi said. Oh Min-hyuck, coming out of a public restroom in Seoul Station, also expressed satisfaction. “The toilet’s odor has been dramatically reduced. The best thing is that I don’t have to see the feces-smeared toilet paper filling the bins anymore,” Oh said. Some janitors said the trash can removal improved their working condition as well. “Before the trash cans were removed, it was difficult to separate dirty toilet paper from other recyclable garbage. As people now flush the used toilet paper, it is much easier to clean up the restroom these days,” a female janitor at Seoul Station told The Korea Herald. Most of the cleaners the Herald spoke to, however, complained that public restrooms are becoming messier due to the absence of waste bins. “The public restroom might seem cleaner compared to the past, as we constantly clean up the restrooms quickly. From my point of view, however, nothing has really changed,” a cleaner at Sinchon Station said. The worst problem is the frequently blocked toilets, the cleaners agreed. “I find clogged toilets at least twice every day, even though I work here during the afternoon only,” the cleaner added. Kim Yoon-soo, head of Seoul Station’s environmental management, agreed with the cleaners’ claim. “When Seoul Station first removed the trash bins from the restrooms, the number of times that toilets got blocked skyrocketed. The number has been slowly decreasing these days, but the blockages do occur more frequently,” Kim said. Seoul Metro statistics also indicated that blocked toilets correlate with trash bin removal, as the increase in incidents correlates with when the waste bins were taken away. 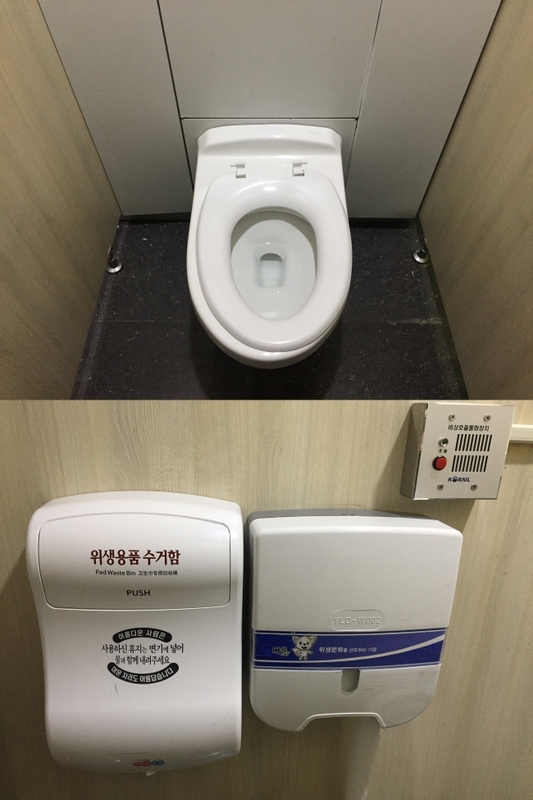 In a survey of public restrooms at stations on Subway Lines 1-4, the number of times that toilets became clogged up surged from 648 to 1,049 in August 2017, when Seoul Metro took away trash bins from the men’s restrooms. When Seoul Metro removed the trash bins in both men and women’s restrooms in September 2017, the number increased to 1,448 and peaked at 1,709 in December the same year. 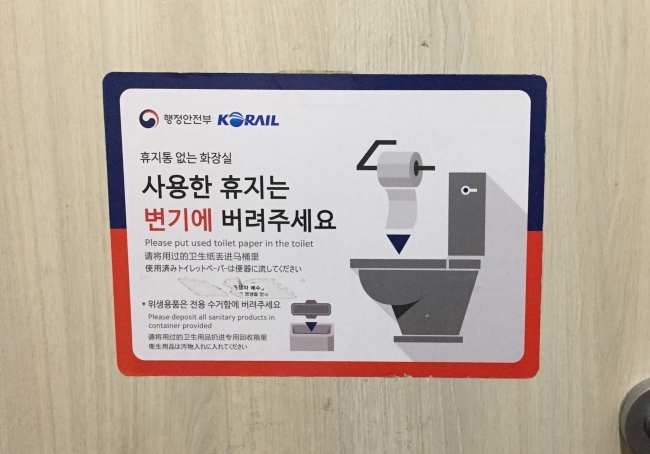 “In a bid to prevent toilets from getting clogged, Seoul Metro has been offering toilet tissue that easily dissolves in water since we removed trash cans,” Jeong Seung-ok from Seoul Metro’s public relations department told The Korea Herald. Jeong said the subway operator picked the 20 stations where toilet blockages are most frequently reported and plans to rebuild the restrooms to increase the size of the pipes. The clogged toilets, however, are often caused by public ignorance not the size of the drainpipes, according to a government official in charge of the public restroom environment. “Experts say Korean public toilets’ drainage systems are not very different from those of other countries. Some drainpipes in Japan’s public restrooms are narrower than Korea’s pipes,” said Joo Eu-ddeum from the Ministry of Interior and Safety. The Interior Ministry has designed a sticker that urges public restroom users to flush used toilet paper and has shared the image via its website. The stickers can be commonly found inside doors, at eye level for those sitting on the toilet. Also, the ministry has made videos and banners to promote the message. The advertisements are displayed near public restrooms, highway service areas and stations on busy days, such as the Chuseok and Lunar New Year’s holidays. “The government can’t force trash bins in private building restrooms to be removed. The ministry, however, believes that the country’s toilet culture can be improved gradually as people get used to restroom manners (of flushing the used toilet paper) from public restrooms,” Joo said.